Age 91 of Wilmington and formerly of Manhattan, passed away Thursday, March 7, 2019 at Alden Courts of Shorewood. Born May 21, 1927 in Joliet, Illinois, Margaret Ann was a daughter of Harry F. and Margaret Ann (Robson) Rogers. She was raised in Knoxville, Illinois before moving to Wilmington, where she graduated from the Wilmington Public Schools in 1945. Following graduation, Peg worked for Clara Hartley Woodard in the Will County Clerks Office. On March 16, 1947, she went on to marry Calvin C. Geiss in the First Presbyterian Church in Wilmington. Together they made their home and raised their family in Manhattan, as well as co-owned and operated C&A Disposal of Manhattan. 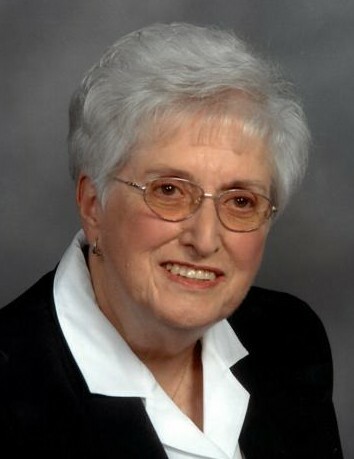 Peg was an active member and Deacon of the First Presbyterian Church in Wilmington and formerly belonged to St. Paul United Church of Christ in Manhattan. She was a past Worthy Matron of the Elwood O.E.S. #761, and belonged to the Wilmington American Legion Auxiliary. Peg volunteered at Silver Cross Hospital; loved to sew, cross stitch and embroider, and took pleasure in working puzzles and reading. She will also be remembered for her cooking and baking. Together with family, Peg and Cal loved camping at Woodsmoke Ranch, and enjoyed traveling and snowmobiling. There was no hobby greater to Peg than her family, and she cherished spending time with her family, grandchildren and great-grandchildren. Though Peg is no longer with us on earth, she leaves a priceless collection of memories. The family finds comfort in knowing that she is in peace and again reunited with her beloved husband, Calvin. Survivors include her children: Katherine (Dave) Melhorn of Wilmington and Danny (Donna) Geiss of Manhattan; six grandchildren: Paula (Walter) Smith of Braidwood, Mike (Sandy) Melhorn of Wilmington, Jeffrey (Ferly) Geiss of Charlotte, NC, Kevin (Melanie) Geiss of Murrieta, CA, and Stefanie (Joel) West and Nicholas (Neely) Geiss, both of Joliet; (18) great grandchildren: Jessica Melhorn, Meghan Smith, Allison Melhorn, Katie (Justin) Naida, Emma Smith, Haley Melhorn, Ashley Melhorn, Lilly Smith, Andrew Elliott, Lauren Elliott, Jacob (Sarah) Elliott, Shelby Olsen, Calvin Geiss, Peyton Geiss, Lilly Olsen, Keighan Witte, Moira Geiss, and Daniel Geiss; one great-great grandchild expected; three sisters-in-law: Ann Rogers of Florida and Adela Geiss and Norma Geiss, both of Wilmington, and numerous nieces, nephews, cousins and extended family. Peg was preceded in death by her parents; husband Calvin (January 31, 2002); sister, Lucille (Bill) Weidling, and brother Lew Rogers. The family will receive friends for a visitation on Sunday, March 10, 2019 between the hours of 1:00 p.m. and 5:00 p.m. at Baskerville Funeral Home, 700 E. Kahler Road in Wilmington. Funeral services will follow Monday morning, March 11, 2019 at 10:00 a.m. in the First Presbyterian Church, 301 N. Kankakee Street in Wilmington. Burial will be in Brown Cemetery in Elwood, where Peg will be laid to rest with her late husband Calvin. Pallbearers and honorary pallbearers will be Paula Smith, Mike Melhorn, Jeffrey Geiss, Kevin Geiss, Stefanie West, Nicholas Geiss, Walter Smith, Sandy Melhorn, Ferly Geiss, Melanie Geiss, Joel West and Neely Geiss. Preferred memorials may be made as gifts in Peg’s memory to First Presbyterian Church of Wilmington or to Joliet Area Community Hospice. The family wishes to extend their sincere gratitude to the caregivers, aids and activities director at Alden Courts in Shorewood, especially Kayla and Carrie Ann. The exceptional care extended will always be remembered by the family. Family and friends may sign the guest book, upload photographs or share Peg’s memorial page online by logging onto: www.BaskervilleFuneral.com/notices/Margaret-Geiss.